Comments: Katherina Bindrim (Nee: Schneider) | IL US | 1851-1900 | Comments: Trying to locate the cemetery these 4 people are in. The woman on the right is Katherine Bindrim. It is unclear as to her husband may be either taking the photo or is next to her with the pocketwatch. Her husband's name is William. The other woman may be their daughter, Katherine. Era is circa 1880 to 1885. 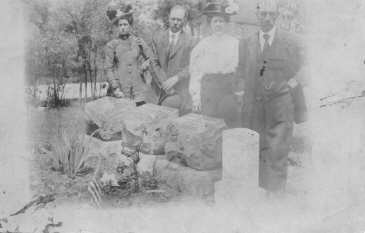 Clues to cemetery is greatly appreciated and information about these people is greatly appreciated.